Eastern cultures have consumed tea to maintain good health for thousands of years. Ancient Chinese texts list Camellia Sinensis in its pharmacopia as an herbal medicine for improving health, increasing longevity and keeping the mind alert. Eastern cultures engage in tea drinking not only for the health benefits it has to offer but it can also be a time to zone out if you will from the rest of the world. Tea time is taken for many reasons. For some it is a way to socialize and reconnect with friends and family, while others make tea time as a way to reflect on the day or life in general, to elevate ones consciousness or to enter a state of simple meditation. A good cup of tea has a way of nurturing the soul, balancing the senses and clearing the mind of everyday clutter. Many medical and healthcare professionals agree that drinking tea is a healthy addition to any diet. New scientific research has unveiled powerful chemicals in tea like catechins [a type of polyphenol] also found in red wine that hinders free radical activity in the body. Free radicals weaken the cellular structure of the body and set the stage for premature aging and can lead to the development of various types of cancers. The American College of nutrition speaks to research reviews that conclude green tea may reduce the risks of ovarian, prostate and breast cancer. Harvard Medical School confirms tea contains substances that lower the risks for heart disease, cancer and diabetes. The Department of Nutrition at Harvard School of Public Health encourages a healthy diet which includes whole grains, fish, fresh fruits and vegetables in conjunction with green tea. The University of Maryland advocates the consumption of green tea for a number of chronic disease conditions. The University of Maryland also supports claims that green tea is effective in ridding the body of excess fluids, regulating blood sugar levels, reducing cholesterol levels, regulating body temperature and improving mental alertness and overall health. Tea is packed with antioxidants, polyphenols, amino acids, vitamins and minerals. It is the ideal beverage to consume for the reduction and prevention of health imbalances, chronic diseases and to maintain overall wellness. 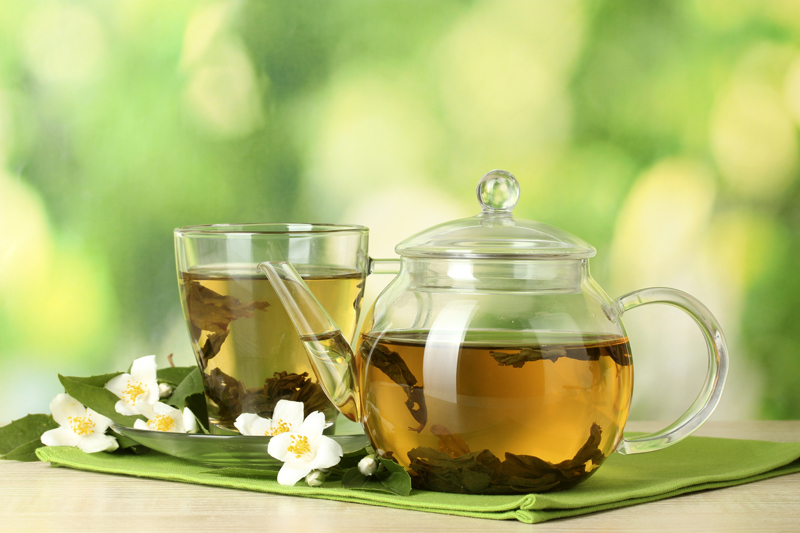 Black, white, green, oolong, pu-erh and yellow teas are all the product of one plant….Camellia Sinensis. Herbal teas and tisanes do not fall into the same category as the teas harvested from the Camellia Sinensis plant. Herbal tea drinkers also derive similar health benefits found in green and black teas. The advantage for herbal tea drinkers is the vast variety of beneficial chemical compounds found in thousands of plants from around the world. Many of these plants are just being introduced to the Western world, yet they have been used by indigenous peoples as medicine for centuries. In the world of medicinal herbs, it is said that for every disease known to humankind God made a plant to reverse that disease. We don’t need to look very far for evidence to confirm those claims if we know how our Bermudian ancestors dealt with illness from the time of the first settlers. There were no hospitals and clinics back then, yet they studied the medicinal properties of local plants and used them to reverse a number of chronic disease states and health imbalances. Our population flourished and multiplied as a result of the knowledge behind Bermudian folk remedies. Herbal teas have multiple health and beauty benefits. Herbal teas can be enjoyed hot or cold and one can get very creative with an herbal brew by adding fresh fruit and spices. Not only are herbal infusions flavourful and aromatic, they are usually simple and easy to prepare. Let’s explore some of the health imbalances herbal teas can address. If you have anxiety, arthritis, constipation, headaches, heartburn, insomnia, PMS, menopause, gas, digestive issues or the common cold, the right combination of herbs can set you straight. Other benefits include boosting energy and immune function, increasing lactation, detoxifying the liver and kidneys, natural diuretic properties and aiding in weight loss. There are a select group of herbal teas for expectant mothers when they cannot take over the counter drugs to address common symptoms associated with pregnancy, like nausea. Beware of the naysayers!! The FDA along with a large percentage of doctors and healthcare professionals still do not support any health claims attached to the wellness factor of consuming tea of any kind. Despite the ongoing research released on the benefit and prevention of illness by consuming green, black and white teas, the jury is still out within the allopathic community and the big pharmaceutical industry that tea is more than just a beverage. Nevertheless, it is very difficult to dispute centuries of accumulated knowledge and folk wisdom when evaluating the efficacy of tea as medicine. Please make sure that you are sourcing high quality herbs and teas when purchasing tea. Due to the popularity of tea consumers are often manipulated by false advertising when buying teas. Many commercial brands contain pesticides, dyes, artificial flavours and added sweeteners that are not often listed. If you are shopping for a beverage that simply taste good, then maybe a good quality tea is not for you. Green, black, white, yellow, oolong and pu-erh teas all contain caffeine. If you are caffeine sensitive, do not drink teas that contain caffeine as you may experience heart palpitations, anxiety, insomnia, shaking hands or muscle spasms. Use caution when consuming tea and taking medications. Mixing tea with medications may cause a drug herb interaction and result in health complications. Also use caution when administering tea to young children. Strong doses of herbs are not recommended for young children or pregnant women as they may have an adverse reaction. If in doubt consult with a knowledgeable herbalist or complementary and alternative medicine [CAM] practitioner regarding the safe use of herbs. This was a helpful lot of info. I prefer drinking my loose leaf Pureh tea & other teas hot, during & after my meals. MMM M GOOD. Is the process of removing the caffeine from teas healthy? Thank you for the article on tea. “Going forward”, may be an article on suger, or how to reduce fat acumulation on the body, Heart attacks or Heart disease and strokes if we all only knew how to deal with those as it hapens. Alcholism and the entrapment of adiction are big problems here. Worst of all is Cancer a horrible, horrible, disease,all cause early death. Do you know who a good samaratan is ? You just read her Bernews article ! puts patients above the purse ! Thanks a lot for sharing the benefits of tea. I prefer to have black tea. Black tea contains low amount of caffeine, which gently enhance your blood flow to the brain, keeping you awake.